This past friday, February 20th, I was incredibly honored to receive the James Renwick Alliance Award of Excellence for Innovation in Craft along with Stacey Lee Webber, pictured to my right at the American Craft Council’s Baltimore Show. It is the first year that JRA has presented this award with the awards juried by JRA board members, Judy Wiesman, Marc Grainer and Sean Hennessey. The Renwick Gallery of the Smithsonian American Art Museum showcases 20th Century American Craft and the Alliance’s mission is to celebrate and foster scholarship, education and public appreciation of achievements of American Craft Artists. Of course, it is so very gratifying to have my work acknowledged, but I am also so pleased for my work to be a conduit for broader awareness of the felt medium. 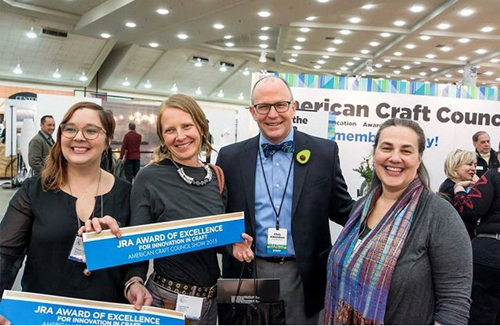 Many thanks for the capturing and sharing of this picture on the JRA Facebook page with American Craft Council Executive Director, Chris Amundsen and JRA board member, Rebecca Ravenal.